I must apologize...I seem to have not taken photos of my finished quilts for the Kona Solid challenge...last week was kind of insane. Since doing the Solid challenge, I've wanted to push myself color wise a bit, so here is this green and orange pieced bit. What other color combos should I try? Pink and grey is up next, maybe pink and green, and perhaps some blue/orange.. 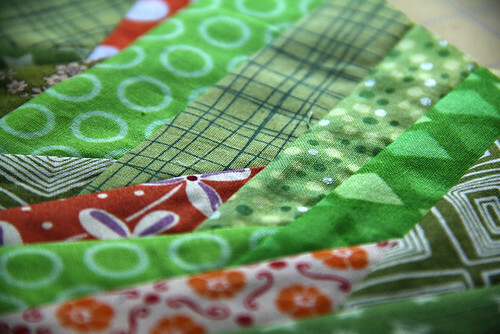 I will send you some photos of your quilts as soon as possible!